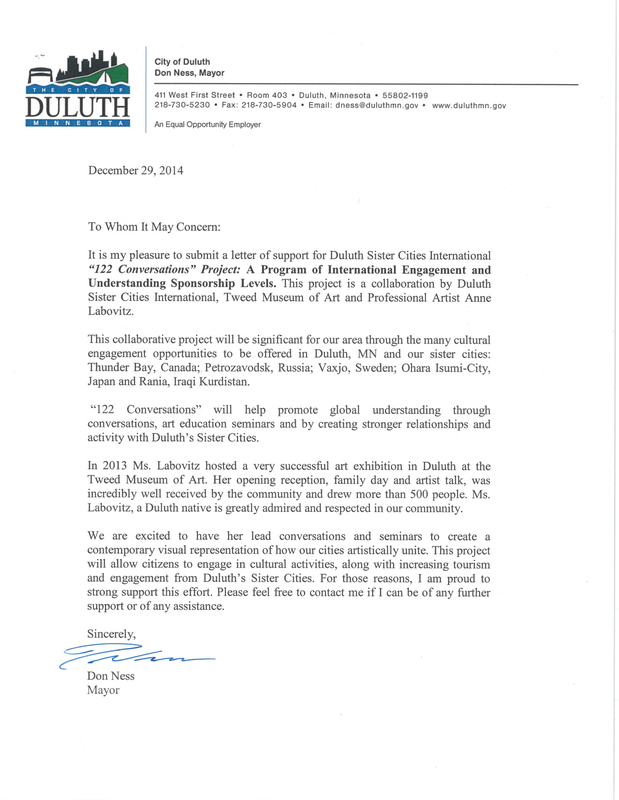 Read letters of support for this project from the former mayor of Duluth, MN, Don Ness, the current mayor of Duluth, Emily Larson as well as from the director and curator of the Tweed Museum of Art, Ken Bloom. 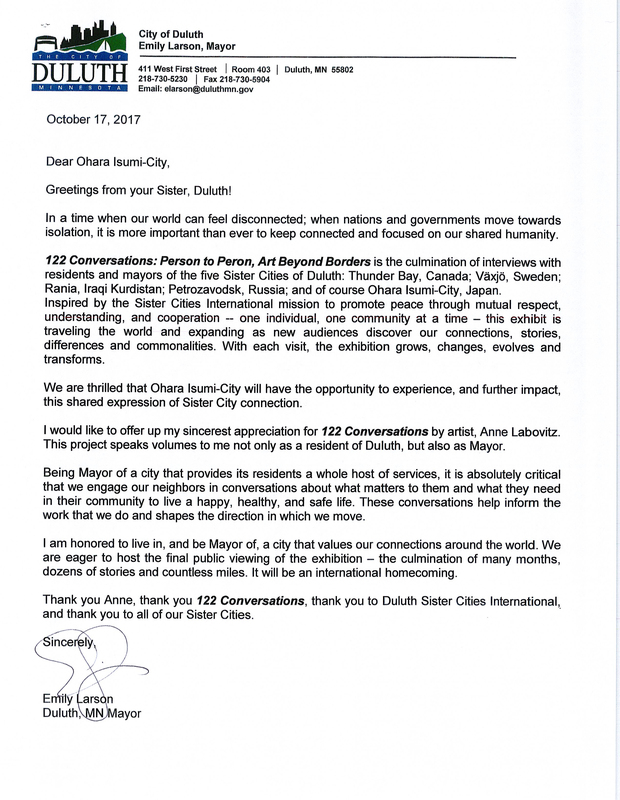 The 122 Conversations exhibit in Rania brought together a host of community members, some representing the Raparin University, city officials, and Sister City delegates. “Wow! Wow! This is hyper modern art at its best!,” declared the director of the art dept., as he stood there transfixed. I had to Google to find the definition of hyper modern, because this term was not in my vocabulary.He said the script (writing) on the banners were like ‘musical notes, and a feast to the eyes’. That same evening we had the grand opening which drew a standing roomful of citizens from toddlers to senior citizens. In Isumi City folks looked up to the balcony in awe as the banners from the five sister cities were unfurled one at a time. Some described them as ‘waterfall rainbows’ and wished they would be there permanently. Jeri and I were part of a 5 person delegation that visited our Sister City Rania, in Kurdistan, Iraq in January 2017. They have a beautiful new university, and “122 Conversations” was going to be exhibited there. The whole exhibit was neatly packed into one suitcase, and the first amazing thing was the look on our hosts’s faces as they watched roll after roll come out of this suitcase – much like watching clowns exit a VW bug at the circus. Everyone pitched in to hang the paintings and set up the interactive displays. The Rania Art Professor was absolutely ecstatic when he saw what we had. The opening was a great success; local dignitaries, university personnel, and school children all came and it was a noisy, crowded, fun event, and served as just one more dab of glue helping to cement the new relationship between our cities. We were also part of the November delegation to Ohara Isumi-shi, Japan that was present for the grand opening, as well as attending a number of other events at which Anne worked. . Anne came and spent over a week, working with local artists and city officials to produce a true extravaganza.The opening took place at City Hall, was very well attended, and was dramatic – each of the 12 paintings that make up “122 Conversations” was unrolled from a balcony and allowed to hang free above the main foyer through which one enters the building . What a spectacle. But as delightful as that was, Anne’s work with local artists to provide demonstrations and hands on painting opportunities for school children throughout the week using numerous venues, was absolutely wonderful. There were magical moments. How did you feel participating? It was an honor to be involved. The exhibition was stunning! It was wonderful to help Annie develop and lead workshops with college students, school groups, and the deeply moving Family Day with refugee children and their mothers. I loved watching Annie’s method of including and welcoming everyone into the gallery and into the workshop; it was a true celebration of global harmony through art. She filled the art gallery with rich magical colors, metallic glimmering text and energetic marks, which were a visually dazzling contrast to the dark winter white of March outside. Everyone who entered the gallery smiled and was filled with excitement. It was a welcoming space and in the middle of the gallery was a place to sign in, to actively participate and engage in the creative space and to build community. 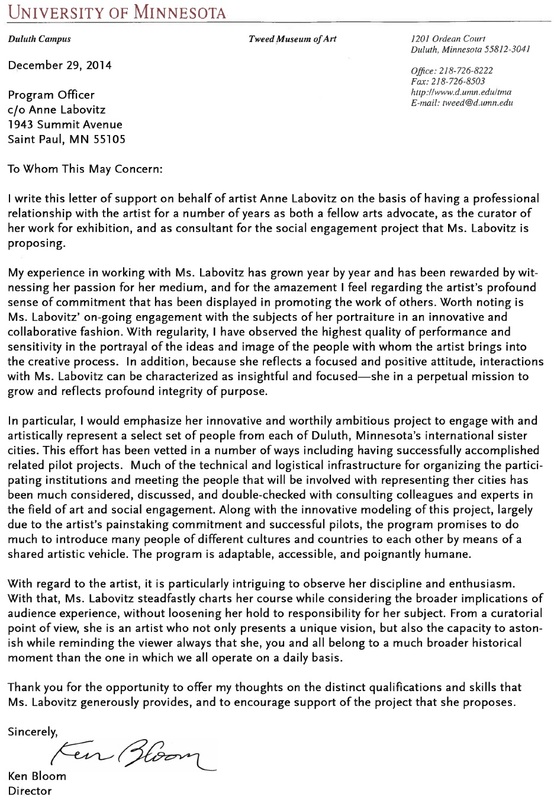 Her project goals of building cultural bridges and creating respectful cross cultural understanding was fully realized. I assisted Annie in 9 art workshops with children and youth. It was a dynamic exchange of ideas, critical discussions, and empowerment for the youth and their teachers involved: We had one student from Syria create the most beautiful symbolic drawing of hands with flags from Sweden and Syria. He drew religious symbols coming out of the fingertips and in Swedish he wrote “there is no difference.” At the Family Day, refugee children and their mothers were each welcomed by Annie with warm embraces, food, art tables set up. It was a welcoming space for them. People entered timidly and after 2 hours left smiling, more confident, happy and many had painted their faces, made paper flowers, received art supplies and had found a new sense of belonging in a new place. It was an absolutely magic day and months afterwards, the Konsthall staff asked for the refugee to contacts to invite them back. This was wonderful news. I still think back to this as one of the most important teaching experience of my career as an art educator. I will never forget the eyes of the refugee children and their deep appreciation for Annie’s political act of caring.